And you? Will you do the same? 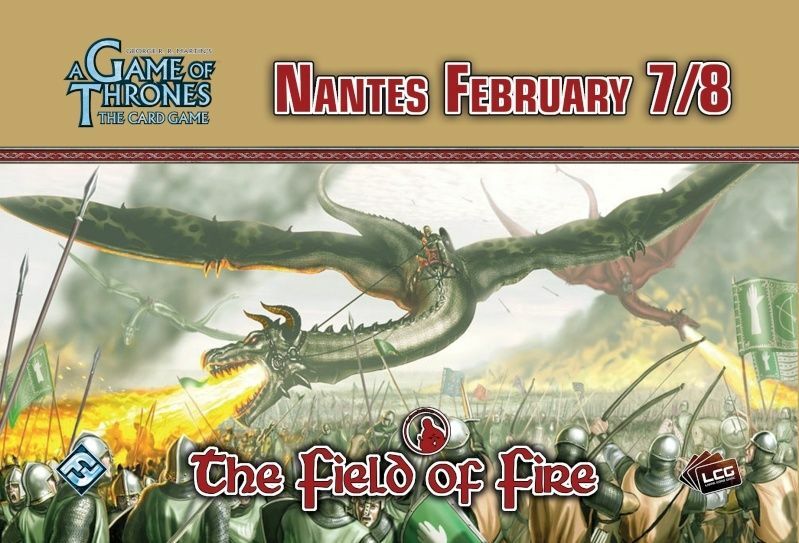 After the success of the 2014 French Nationals, their organisers and the association La Garde de l’Ouest have decided to create a new great week-end of Game of Thrones. Taking advantage of the Store Championship season, and pushing the tournament with a strong international promotion, we hope to propose you a European and cheerful event as the West(eros), earth of mythes and legends, can offer. Format: Joust swiss rounds on Saturday and Joust Tops on Sunday. Melee as Side Event on Sunday. Participation Fee: Online payment only, 30€ . Food: Lunch included on Saturday and Sunday. Accommodation: Local players will be happy to welcome you home for free (priority for foreign players). Limited amount of places. List of low price hotel coming. The airport is located quite near the city, a bus line will get you to the city center in less than 30min. The transport network in quite dense in the city and can easily get you to anywhere you want. Do not hesitate to tell the organisers that you are arriving at the airport, we will give you every information you need from there. -If the tournament gathers 65 players or more > Travel, registration and accomodation fees offered for Castle Stahleck 2015*. -Bye for a regional for the first French and first foreign players. * to a maximum of 400€.